MOT – Motivate Our Teachers…or Mad Old Tristram? It’s a bloody outrage, how dare he? I’m not a car! I don’t need more hoops to jump through. Yeah, yeah, yeah whatever. As with any idea that could affect how the cogs of education turn, @TristramHuntMP’s suggestion that teachers should have a licence to teach was devoured on twitter and the blogosphere quicker than a teacher’s packed lunch on the first day back after the holidays. It wasn’t helped that his proposal had been abbreviated into an over simplistic idea that provided an easy target for pretty much anyone with access to the internet and at least one opposable thumb. Let’s get the basics out of the way: There will always be those who feel hard done by and who live their lives eternally bothered by the fact that their job warrants scrutiny by people other than themselves. Those people should largely be ignored. Criticise by finding faults/flaws and suggesting better alternatives not by screaming ‘It’s not fair.’ So if you have read what Hunt has suggested and object in principle to the profession seeking out robust quality assurance and methods of self-improvement then maybe it’s time you just went away. Now let’s focus on the idea – there are some good thoughts hidden in what Hunt said but in my humble opinion they are either not good enough or facsimiles of what already happens in schools up and down the country. He talked about teachers being ‘motivated’ and ‘passionate’ as if these were equal to competency in the classroom. It was as if the media-savvy side of his brain was thinking ‘They’re not going to like this so if I just go on for ages about how teachers are important and passionate – and I mean really go on about it – I might be able to slip the idea in and they won’t mind.’ Don’t insult us: yes passion is a great motivator but we all know that sometimes it can count for bugger all. As the saying goes: just because a cat has kittens in the oven, that don’t make them biscuits. 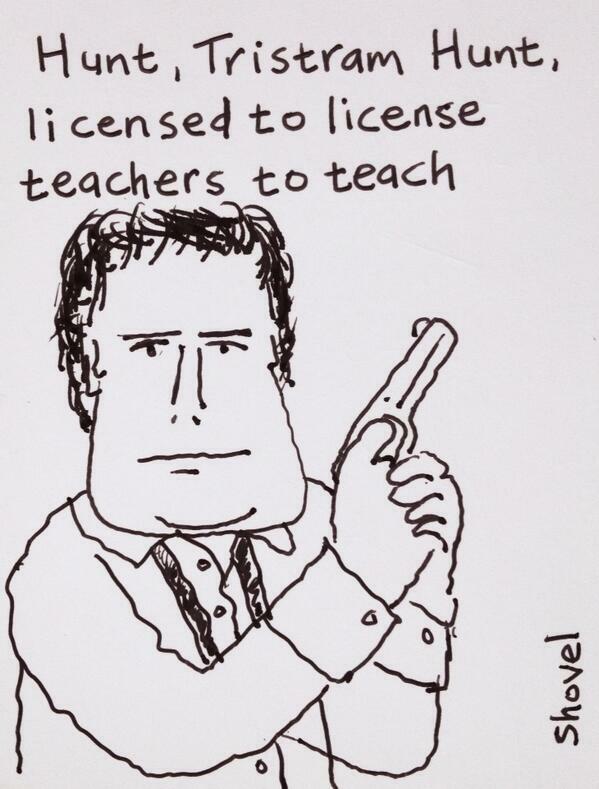 In fact he sort of did say this too but annoyingly I think the weakest part of Hunt’s statement was introducing this ‘licence’ as the way of guaranteeing teachers engage with professional development: ‘If you’re not willing to re-engage in re-licencing to update your skills then you really shouldn’t be in the classroom.’ This does make it sound like it is the process of the re-licence that will keep teachers qualified which I believe is wrong at worst or a distortion of school’s robust appraisal processes at best. We already have performance management and now a teacher’s appraisal is linked to their pay. If this is done well the Head will ensure that this establishes a culture where teachers proactively engage with their own development in a way that not only meets the needs of the school at that time but also improves their personal approach to teaching. So…do we need a licence to prove it? Ah yes, but what about those schools where performance management is just a tick boxing exercise and the teachers don’t respect the views and judgements for the senior leadership team? Well, I hate to break it to you but a licence ain’t going to change either of those problems. The biggest problem there is the leadership: it is your job leaders to create that positive culture where reflections are not attacks and improvements are individualised rather than regurgitating the latest initiative of the week. Putting in an extra layer of accreditation through a teaching licence seems to me to be either fixing a problem that isn’t there or an inadequate way to patch up failing schools. The most noble part of Hunt’s statement was the notion that teachers should be valued as a profession to the same degree as Doctors and Lawyers. I and I’m sure everyone in education would agree that we should be as valued because we ARE professionals. But surely the point here is the perception of our professionalism rather than the nature of it? If (and I know it’s a big ‘if’) but IF schools are led effectively everyone in that organisation can hold their heads up high. If Hunt has an issue with unqualified teachers working in schools, well, address that issue on its own and leave the rest of us out of it. So I thank you Mr Hunt for your efforts and you at least gave me something to write about this Sunday. If you are desperate to develop this idea you can count on me to engage with it positively. But you haven’t got long, the election’s coming soon and I’ve got my car booked in for its MOT next month and that hunk of junk has got less chance of passing than Gove being asked to appear in the new series of Blackadder.